His Eminence, Metropolitan Gregory was consecrated as Bishop and enthroned as the Ruling Hierarch of the American Carpatho-Russian Orthodox Diocese of the USA on November 27, 2012. On August 29, 2018, Metropolitan Gregory was elevated to the rank of Titular Metropolitan of Nyssa by the Holy and Sacred Synod of tyhe Ecumenical Patriarchate of Constantinople. Rev. Fr. Daniel Mahler has served St. Mary's Parish since 2009. 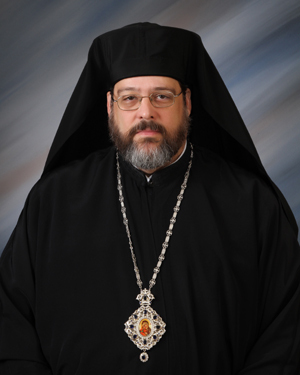 He was ordained a Deacon in 2002 and as a Priest in 2006 by His Eminence, Metropolitan Nicholas of Amissos, Ruling Hierarch of the American Carpatho-Russian Orthodox Diocese. Father Dan and Pani Joan were born and raised in Bridgeport, Connecticut and attended Saint John the Baptist Carpatho-Russian Orthodox Church in Bridgeport. In addition to serving as Pastor of Saint Mary's, Father Dan, with the blessing of His Eminence, Metropolitan Nicholas of Thrice Blessed Memory and His Eminence, Metropolitan Gregory serves on the Board of Trustees of Holy Myrrh-Bearers Monastery in Otego, New York.